Any cartoon-loving philosopher will be sympathetic to a book such as this, a handsomely-produced romp through the lives and thoughts of major thinkers from Bacon to Voltaire. 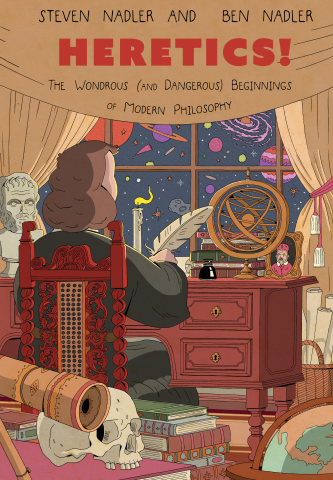 This is obviously not the first time that philosophical ideas have been presented in graphic format, but neither is it the first time that this reviewer has wondered if anyone who feels motivated to explore philosophy would also feel the need for a relentless comic strip of chirpy cultural history and biography. A life without cartoons would be a poor business, and philosophy can be fairly valuable too, but the combination is a dubious enterprise, particularly when the cartooning style makes all the faces so similar that, throughout the book, the main characters seem to be the same bloke with different wigs. If you doubt this, have a peep at the ill-advised group portrait at the end of the book. So this is turning out to be a disappointed review, despite the fascinations of Spinoza and Leibniz. Perhaps it was not meant for the likes of me. The thing to do, then, is to leave this review unfinished, and offer the book to a bright 12-year old, and see what he thinks.